How to Make Slime - C.R.A.F.T. 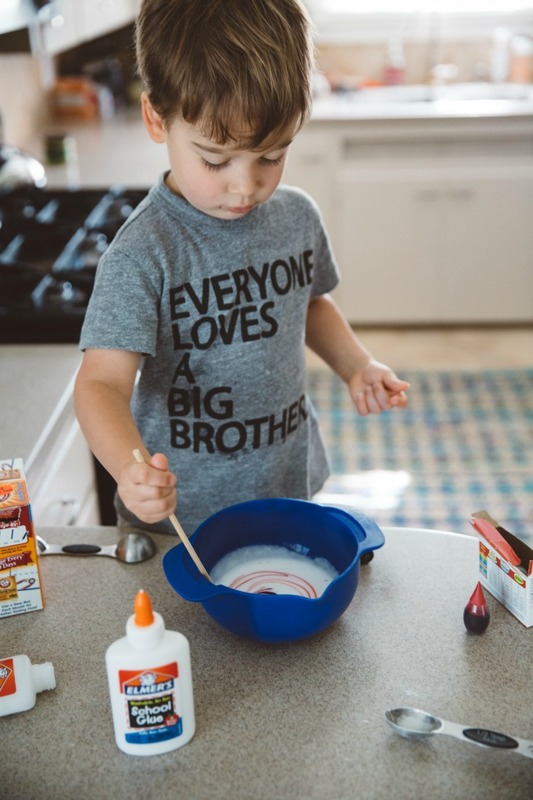 Slime is all the rage with the middle school kids right now, so I decided to make a batch (or 3) with Maxwell and see what he thought about the slime craze. (He loves it!) It’s the perfect rainy/ snowy/ too hot outside activity! 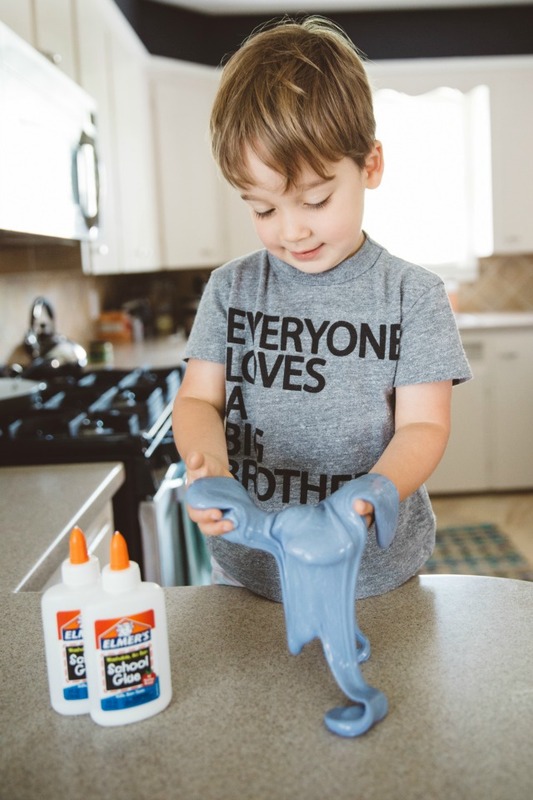 I teamed up with Elmer’s to make slime that is perfect for little hands. 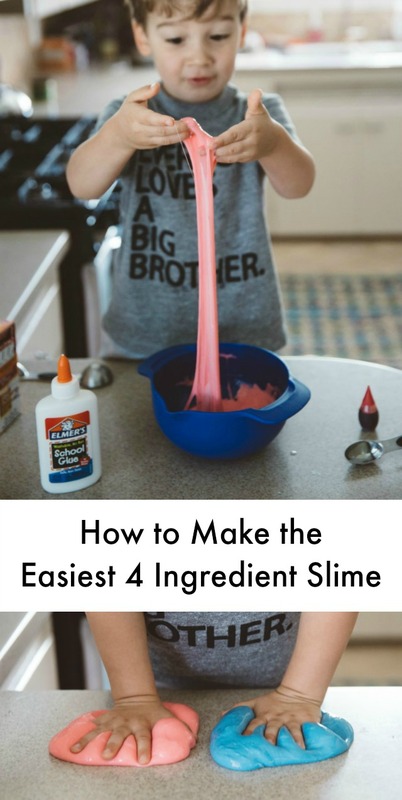 We are sharing how to make slime with 4 ingredients, likely all things you have on hand right now. 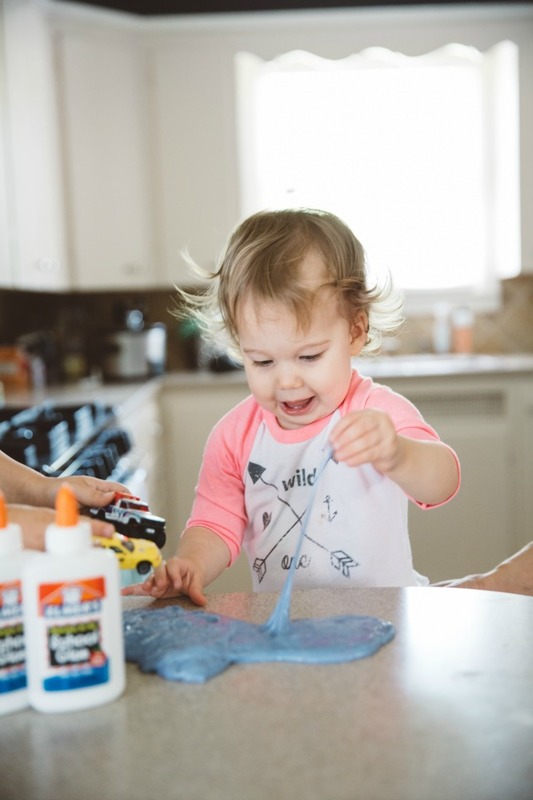 There are also lots of learning activities you can do with slime, our favorite proved to be a lesson on mixing colors! Something to mix with, we used a left over chop stick. The stick end of a paintbrush would work well too. First, empty the entire 4 FL OZ container of Elmer’s glue into the bowl. Maxwell loved this part and was very patient to let the last drips drip out of the bottle. Next, add a half tablespoon of baking soda and mix well. Now, it’s time to choose your slime color. 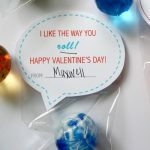 This was a tough choice for Maxwell, so we decided on making two batches! The first red and the second batch blue. Then mixed them together to make purple! Mixing the food coloring into the glue and baking soda concoction is mesmerizing! Take your time mixing the color, it’s fun. The last step is to add 1 TBSP of contact solution. Mix until the slime forms and gets harder to mix. Give this step some time, the slime will likely take 6-8 minutes to form. Take the slime out of the bowl and knead it with your hands for a minute or so. It’s the perfect slime texture, doesn’t stick to everything, but pulls apart perfectly! 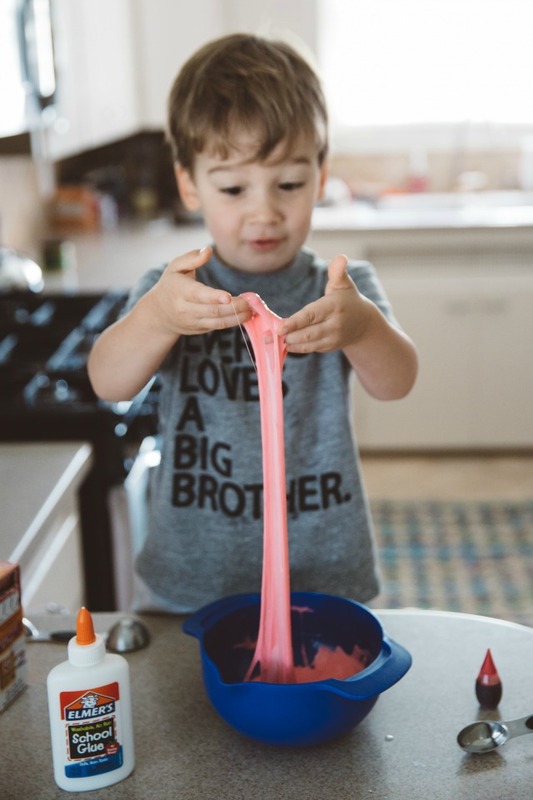 Maxwell loved playing catch with the slime, making imprints in the slime, and investigating how far it could stretch. 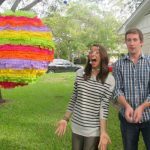 Slime was a winner in Casa de Dorobek! Someone else also loved the slime, but she really just wanted to eat it, which is not a good idea. Can you see Max trying to get his cars in the slime? He loved making the wheel imprints! 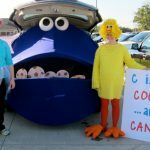 I would love to get my hands on some clear Elmer’s Glue and add tons of glitter! Or even Glitter glue!?! After mixing, add your choice of food coloring and mix. Mix until slime forms and it begins to get harder to mix. 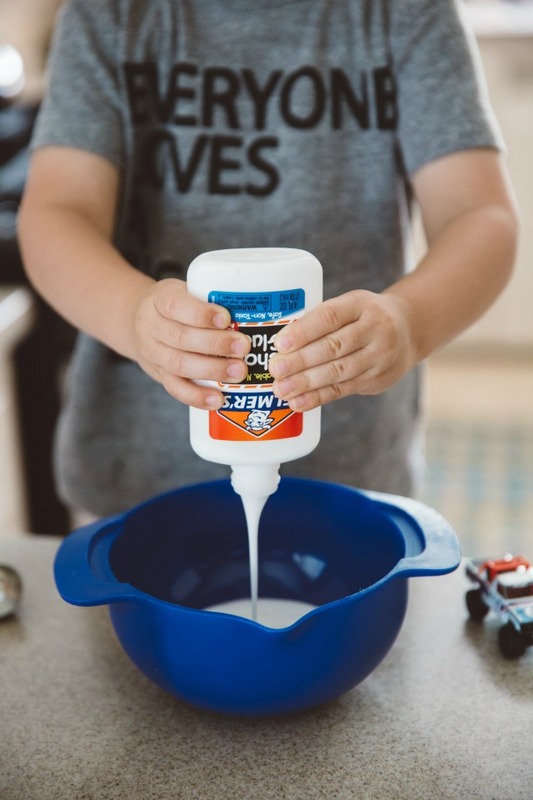 If needed you can always add ¼ TBSP Contact solution to make the slime less sticky. Get ready to make batch after batch, slime is addicting! 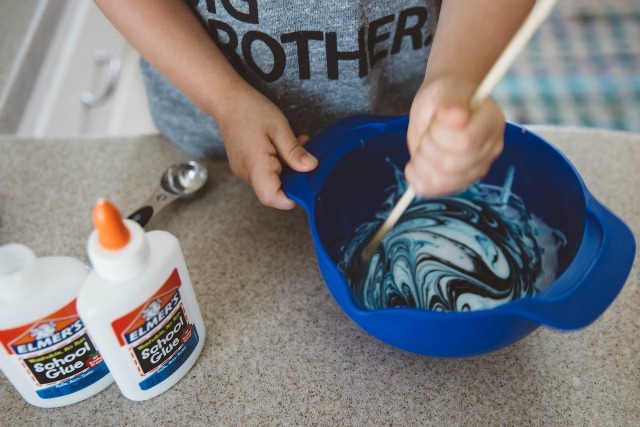 And if you are looking for more slime recipes, Elmer’s a few really fun ones including galaxy slime! It’s a saline solution for people who wear contact lens. A bottle costs a couple dollars at any grocery store! I hated my kids coming home from playgroup when they had been playing with slime. If I remember rightly they called it gloopy glue at my child’s playgroup. I’m glad my kids are growing out of such messy things now! 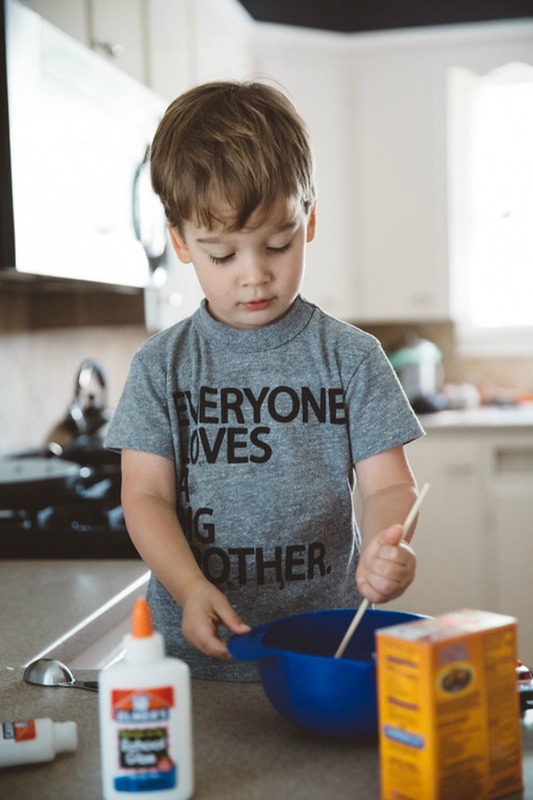 Kids will be kids and the messy things are the things they will remember and being a mother of 3 i know that is when they will be having the most fun… I feel sorry for the children whos parents dont allow them to do such activities. It is a solution that you put inside the contact lenses house(the tubs that you put them in) a bottle is really cheap and easy to find!! Yea did this exactly and it turned out like rubber. Lame waste of money. You just need to knead the slime a little more and add a few more drops of contact solution! Your slime was almost there! Oh no, I’m sorry! If you try again, don’t add extra baking soda. Add more contact solution and knead with your hands. Just wanted to thank you for this awesome tutorial. I love how you show the kids doing it and having fun! 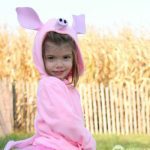 It was featured on my website, and it was our favorite out of the three we selected! Terrible! It turned into a goopy mess. Do not use! Add a few more drops of contact solution and continue to mix! You were so close!! Pick the crazy glob up with your hands and knead it for 5-10 more minutes! It will come together 🙂 I’m realizing the brand of contact solution does make a big difference! Yes! Your contact solution has to have borate or boric acid. The first time I tried to make slime I was using a contact solution that didn’t have it and it never worked no matter how much contact solution I added. What kind of contact solution do we buy? My 10 year old granddaughter loves this recipe. She made slime for the first time. THANKS!! I recently watched a video about it! I will try and find it and link to it. The video basically said that borax is only bad if you are using it excessively, but using it to make slime a few times a year is no big deal. Thanks for letting us know! When ever I try to make slime, I freeze it and it turns out all liquidity. Contact solution has borax in it, so this recipe does have borax. is the recipe correct when it says 1/2 Tablespoon? Is it a half of a teaspoon? I am using this for a science experiment and it also turned out like rubber. I read a comment that said the same thing and you said to kepp kneeding it, but no matter how hard and long I kneed it, it kind of makes it worse! what did I do wrong?! Does it have to be Elmer’s glue? I’m sorry you are getting such negativity from people who can’t follow directions and have no patience Jamie. My girls think that slime is the bomb. They can’t make enough. There are countless colors and countless uses. It’s crazy but even i love it. Remind me again how you can be a mom and not like when your kids have fun?? Also Jamie, i will research where i found the edible slime so your daughter will be safe to have fun too. Keep letting your kids make messes honey, it’ll be what you miss when they’re grown. Wow! I did not expect for it to be this good! Thanks for the tutorial! I made this several times now. It turned out great. Thanks for the recipe.